I’m a big fan of Andy Lau. Growing up, I’d stay glued to the screen and watch his shows and movies. Each time his songs are played on radio, I would listen intently. I’d also pester my parents to get me his albums. As one of the four heavenly kings in HK entertainment, he is never the most talented in any trait. Jackie Cheung is the undisputed singer, Aaron Kwok is well known for his dance moves, and Leon Lai, i don’t know what’s he’s good at but he has his fair share of fans. Sure, he’s handsome and oozes star aura, but Andy Lau excels in another area – hard work. He’s known by many as the Asian Ironman for his relentlessness in his work, day in day out. Never resting. Never accepting mediocre work. His success is a testament to his work ethics. Displaying amazing endurance with his attitude towards his craft, he’s a class act and role model for many people. I’d often read stories on Andy Lau’s demanding schedule. Despite his heavy workload and years of experience, he still rehearses and practices. Because he doesn’t want to lose. He said if people can score 80 marks, he believes he’s able to do it too. When you’re at home, you’re definitely more prone to losing your temper, he continues. Because your family are more forgiving of your behaviour. Outside, you don’t behave this way as you do at home, because you know people out there are not as forgiving. He got to where he is not because he’s talented, handsome or lucky. It’s a combination of his attitude and hard work. He said in an interview I recently saw on Facebook, that he believes he got to where he is because of his attitude. When asked to define success and failure, he said the greatest success is to accept failures. And the biggest failure is to think one has achieved success. Profound? I think it’s about staying grounded, having the attitude to learn and to put in hard work. Many times we see famous people achieving “overnight” success. How many of these overnight successes are actually years of constant grinding with plenty of stumbles along the way? Speaking of hard work, I’m reminded of what David Oligvy (of which I’m also a big fan of) said – “hard work never kill anyone”. Good day, Mintypers. We’re well into 2019. Are you still making the typo of ending the date with 2018? 8 days into the new year, I’m guilty of occasionally writing the year as 2018. It’s an error that happens every year. Luckily, I think I’m not the only one that does this. How’s your new year resolution going? One week in, are the projects and goals still inline with where you want to be heading? Many new year resolutions fade by the second or third week, and eventually we never revisit them until the end of the year. That’s the time when we reflect and mourn about the missed targets, but resolutely determined to draft out a new set of goals for the following year. Does it work? Not for me. But this time round, it’s going to be different. I’m setting out a system to knock breadcrumbs tasks off – small, achievable stuffs – on route to completing my eventual goals. This year, I place huge emphasis on financial goals. Carrying a mountain of debt is a stressful and unforgiving burden. I’m living pay cheque to pay cheque, without any savings. With a young family to support, I need to get out of this rathole as soon as possible. I’ve landed in the current dire situation entirely of my own doing. I’m extremely disappointed with my lack of self discipline but after struggling for years to face this, I’m ready to tackle this head on and get out once and for all. Another area I want to see positive changes is in my personal health. Too often for the past years, I’m falling sick too easily. Having a toddler means we don’t get a full night of uninterrupted sleep, but blaming it on the helpless child isn’t going to help. I’m beginning to see the need to take care of my health, given my slowing metabolism and degrading immune system. A third place I hope to change is writing more frequently. I know it’s hard to make too many changes in too many areas at the same time. We overestimate how much we could do but end up not doing anything sustainable because they overwhelm us. I’m committed to writing more, because it lifts my mood and makes me a better communicator. I’ve set aside a more fluid goal of publishing once a week here, of at least 100 words. That’s attainable I supposed. This concludes my first post of 2019. Wherever you are, I hope you’re doing great as we embark on the new year together. PS: I’m typing this while nursing a flu at home. It’s lovely to be sitting at the submit. Takes a huge effort to get there, and even greater effort to stay there. Now that Liverpool’s finally top of the league after 16 games, it’s almost surreal to think the progress in just one year. And I wouldn’t swap the irresistible Jurgen Klopp for any other manager in the world. I’ve been using the new iPad Pro 12.9 for about 2 weeks. Bit the bullet and went ahead with this. Was a hard choice deciding between the finally-refreshed MacBook Air or the best-consumer-electric-device-ever-made iPad Pro. Chose the latter and here are my initial thoughts. – Choosing the size of iPad Pro isn’t too hard of a decision. As it’s meant to replace my 13.3 MBP that just died after 5 years of service, I’d think a similar size screen would be ideal. – I spend some time in Apple store, touching, using, the new iPad. Like what other reviews panned out, the 12.9 ipad is indeed much lighter, slimmer, and handsome. – Once I tried out the 12.9 version, it’s hard to go back to anything smaller. The gorgeous screen is the first thing that grasps your attention. – Speaking of screen, it’s a fingerprint magnet. Annoying. Microfiber cloth is its best friend now. – As the Smart Keyboard folio is sold out, my order didn’t arrive till 2 weeks later. During these 2 weeks, I’m absolutely convinced that to get the most out of this sleek, powerful and futuristic iPad Pro, keyboard is requisite. – I was worried that the 12.9 one would be unwieldy and uncomfortable to hold. Not really. The size is like a regular A4 pad. It does get a little weary after prolong holding though. I like to hold it up and read long-form articles. After 10 mins or so, I find myself having to readjust. – I don’t miss my MBP, not yet anyway. Almost all the things I’ve doing most on my MBP – like web surfing, writing, editing pictures, can be done equally well on this ipad. In many instances, the experience is actually better with the tablet. I’m missing the Apple Pencil. It was sold out a few weeks back. Still contemplating whether to get it as a Christmas gift for myself. I see it as a luxury item – nice to have but not necessary to my needs. Well, Apple is blurring the lines between functionality and indulgence with every release. It could be the ultimate indulgence accessory that enhances the whimsical level and usability of this device. I never know you well enough, and you left too soon and abrupt. You brought back sweet memories for me. I was never an active social media user, but I appreciate the visceral design of your app. Your interface, positioning and tiny base suits me. I enjoy that not a whole lot of people know about you, let alone uses you. It’s like the cool, charming man that carries an air of mystery. I’m not sure if I want to extract my limited interactions from you. If anything, I may just let it go. Sometimes the best one could do is to let things be as they are. Selling to the lazy person or marketing genius? Some people have this dilemma when shopping for a bunch of banana. Do I get a ripe or unripe bunch? Can I find just the right bunch to see me through the week? With this “one a day banana” idea, it solves the problem of buying a ripe or unripe bunch. Why choose when you get have the best of both world? 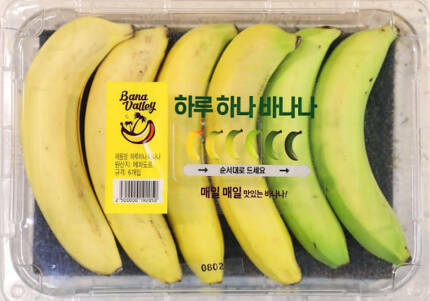 By including bananas of different ripeness in the same pack, they’ve moved away from selling bananas to selling convenience. It’s not just a novel idea with no substance. I can see people who are starved for time and interested in quality of life picking them up. I’m proud to be a Singaporean. This year, Singapore celebrate its 53rd birthday – an infant age compare to the long heritage of other countries. But what we lack in terms of history, we made it up in foresight and drive. In the short span of time, we have come a long way from a city-state with no natural resources to becoming a case-study for others around the globe. We have the most powerful passport in the world. To many of us here, Visa is a form of payment – like Master or AMEX or Diners. As a Singaporean, most wouldn’t think of Visa as something we need to apply when visiting foreign countries. Because everything is already taken care of, thanks to our good ties with many nations. Just last week, my boss had to take a day off to apply visa. When she was there, she realised she had left out a document and had to retrieve it back home, then return back there again. Such a hassle, I thought. We Singaporeans have been so pampered all along that we never understand how valuable our passport is. Our Changi Airport is routinely voted as one of the best airports in the world. I think it’s a truly fantastic hub. Not just a place for transit, or to take off. Housed within the amazing premises, it has spacious aisles, play area for children, excellent wayfinding, clear display for flight information, a comfortable environment, and an efficient tax rebate counter. If one is bored, they can shop around merrily in the airport – it’s just like any of the big shopping malls in Orchard Road. There are plenty of local brands mixed with internationally renowned labels. I know some people travel all the way here to see shop around, dine here, watch the planes take off, and keep the children occupied with many kids-friendly activities. Not many airports can boost this kind of attraction. I for one, used to come here to study and to clear my mind. It’s quiet and calming. And watching the planes take off ignites my wanderlust spirit and get me excited to plan my next trip. There are many other things to be grateful for too. We are always diplomatically neutral. With that, we have played a pivotal role in the global stage supporting or advocating on several key issues. Most recently, we played host to Donald Trump and Kim Jong Un for the meeting in Sentosa. Who would have thought these two nutheads would actually come together for a meet up? During the tour-around one night, I wondered what went through Kim’s mind. Is he smiling because he really enjoyed the beauty of our city? I hope he picked up a few pointers to transform North Korea into a better place. Everyone stands to gain if they stays off nuclear and starts to open up. If they do so, Singapore would’ve played an important role in this success. I know there are significant voices echoing around that our ministers are being paid too high. The ministers’ side of arguments are, if the party needs to attract top talents, they must be compensated on par with the top salary elsewhere. If not, it’s difficult to convince them to drop what they’re holding and join politics. On the contrary, many people countered that serving should be from the heart, not because of how much one would get paid. I’ve had my reservation on this and I see both sides of the coin. Putting that aside, I’m of the strong belief that for any party to see progress, there must be continuation. Since our independence, one party has been ruling the nation. Some are not happy, some want change. Some want change for the sake of change, to shake things up. Is this for the better? Just change la, don’t change never know. But look at how constant chopping and changing effects long-term stability. It’s like a slippery slope. There are of course many things to improve, like accountability and keeping the party in check through constant reviewing. But in general, this is not a decision to be made in haste. It affects the future of Singapore, and our children’s future. But things don’t work this way, not in national building anyway. Things take time to see result. You can’t measure the impact a venue like Esplanade can have immediately after its opening. A decade later, it’s now the place for arts and cultures. Its unique architecture has also become an icon and is recognisable worldwide as a symbol of our country. Before that, people questioned its importance and if we’re throwing money into the drain by building something not many can appreciate. But foresight doesn’t come cheap. I remember once attending a workshop and this guy called Andy told the class, if you can see 10, 20 years into the future, you can shape it. And if you can shape it, paying you a handsome salary is worth it. Our leaders had the vision 53 years ago to build our nation. And when I’m overseas for more than a week, what I miss is the food. Local food is a big part of Singaporeans and I get food-sick if I don’t have my fix of local delights like bak chor mee, carrot cake and nanyang kopi. Our hawker centre is one of its kind, serving inexpensive and tasty food that fills our tummy and warms our heart. For our pioneer generation, we had them to thank for creating what we have now. The torch is now with us to carry the nation into the future. Happy 53rd Birthday, Singapore! Watching Eat Pray Love on Netflix, I’m struck by an awesome phase – Dolce far Niente. You know in some languages, certain words cannot be translated without losing its essence. Dolce far Niente is one of of them. When Liz went to Italy, she made breakfast and sat down to eat. As she was doing that, she said Dolce far Niente. It wonderfully encapsulates the scene – streaks of light seeping through the window, plate of hearty breakfast. Sitting on the floor, slowly enjoying the food. Unhurried, a quint way to start the day. Dolce far Niente now becomes my favourite Italian phase. It means the sweetness of doing nothing. It to the pleasure one gets from being idle. Dolce far Niente is something Italians embrace.